Since the implementation of 6CPC from 1-1-2006, the consumer price index number for industrial worker is not coming down ever but it is increasing month by month. Similarly the rate of dearness allowance paid to central government employees also increasing at the interval of every six months period. The rate of dearness allowance was at zero level on 01-01-2006. After six years from implementation of 6CPC, now the dearness allowance stands at 80% level. The average increase in the dearness allowance is at the rate of 13% per year. Actually there is nothing to rejoice over the increase of dearness allowance. The Dearness allowance is nothing but the reflection of consumer price index. Likewise the consumer price index is determined by increase in the prices of basket of identified essential commodities. The increase of CPI number is not good any way for either the government employees or common people. Whatever the money the central government employees are supposed to get from the dearness allowance hike will be swallowed by the essential commodities for which they have to spend every month, since the prices of all the essential commodities are increasing at the alarming rate. To find out the average CPI for 12 months we need remaining two months CPI numbers. Let us assume that if the remaining two months AICPI numbers stands at 226 levels, the average AICPI for 12 months is 220.0833. 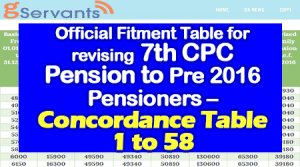 From this it is now very much clear that, even though if there is no change in the position of AICPI numbers for remaining two months, if it happened to continue in the same level of 226 points for remaining two months, the increase in the rate of dearness allowance will be 10% for the next six months starts from July 2013. According to this, the expected dearness allowance from July 2013 for central government employees will not be less than 90% level. So it is expected that the dearness allowance will be increased from existing 80% to 90% level from July 2013. With this 10% increase in dearness allowance, the annual increment for the year 2013 will also be granted for all the central government employees from July 2013.